There is nothing more decadent than a luscious cheesecake especially my latest creation an Almond Joy Cheesecake. My family loves a luscious cheesecake no matter what the occasion, and are always eager to see what I will come up with next. An Almond Joy chocolate bar was invented in 1948 and for those of you who may not have it available to you might be familiar with the Bounty Chocolate Bar which is basically the same thing. My family love my baking skills so much that they send me recipes and pictures to make for upcoming occasions. I’ve made a large cheesecake and small cheesecakes to share (sometimes), and mini cheesecakes, perfect for that afternoon sweet-tooth. This past Easter I wanted to do something a bit different for my cheesecake creation. I’ve done the traditional New York cheesecake, the copy-cat Cheesecake Factory cheesecakes, (White Chocolate Raspberry Truffle is my go–to Cheesecake it’s simply divine as well as their pecan pie pumpkin cheesecake (great for Thanksgiving) which turned out fabulous. I even have my older sister who has always been intimidated of baking a cheesecake experimenting in the kitchen successfully making my cheesecake recipes. I was thinking about how much I love nuts in my desserts as that little extra crunch always adds that last bit of texture in each delicious bite. I pondered what could I do with almonds? I recently created an Amaretto cheesecake and didn’t want to repeat it. It wasn’t because it didn’t taste good but I like to switch up my cheesecake creations so everyone gets to try something new. It’s like wearing a new outfit to every occasion or function I attend. My cheesecake is the star of the show. Coconut and almonds are a perfect pair and it was then that I decided that I was going to make an Almond Joy Cheesecake since I’m a huge fan of Almond Joy chocolate bars. The white fluffy center is perfect for Easter and Spring time. I took to the web to look at recipe ideas and then went to town on my version of an Almond Joy Cheesecake. I was adding, omitting and tweaking as I do with other recipes I make. Making a cheesecake is like going to an ice-cream bar for desert. Start with the basics, and add your fixings/toppings. Don’t worry about the cracks, melt some chocolate, and let that drip all over. No one will notice. The end result will still be the same…Delicious. 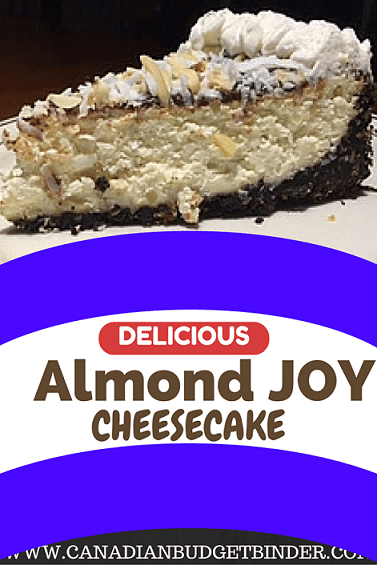 I hope you enjoy my recipe for Almond Joy Cheesecake. Please leave me comments below or if you try the recipe please comment and rate it. If you enjoy Almond Joy chocolate bars and love cheesecake I've married the two to bring you this delicious Almond Joy Cheesecake. Whoever is so lucky to get a slice will rave about it for days. In a food processor, pulse the graham crackers, almonds, coconut, and sugar to a fine crumb. With the machine running, slowly add the melted butter and pulse until it resembles moist sand. Press the mixture into the bottom and 1-inch up the sides of the pan. For the filling: In a standing mixer fitted with the paddle attachment, beat the cream cheese and sugar until smooth. Add the eggs, one at a time and mix just until incorporated to batter. Add the coconut and coconut extract. Add whipping cream. Stop the mixer, and gently fold in the toasted almonds with a spatula until well combined. Transfer the filling to the crust and bake for about 1 hour and 15 minutes (the crust will be puffy and lightly browned - the center may seem a bit wobbly yet ). Once baked, turn oven off but leave cheesecake inside for 1 hour. Once cooled you can continue with the ganache and toppings or chill overnight and top next day. If you like the chocolate to be dripping down the sides, remove from pan prior to adding. Pour the ganache over the cheesecake and spread evenly. Start in the middle of the cheesecake and tilt pan so the ganache covers evenly or drips over sides. Decorate with remaining coconut, almonds and whipped cream. Nothing beats a slice of heaven on a plate and this Almond Joy Cheesecake will surely satisfy anyone who needs something a little sweet. Please share this recipe with your friends if you think they might like it and please leave a review and tell me what you think. Enter your email address on the home page to SUBSCRIBE to my blog. Once you subscribe you will be sent an email from me immediately which you need to open and approve the subscription in order to start receiving my daily blog post. Note: Check your Junk Mail if you don’t see it or email me to check into your subscription status. If you like FREE then click this link for my FREE Excel Budget Spreadsheet and lists. Check out my new Free Recipe Index Plus catch up on all the ways to save money in our Free Ultimate Grocery Shopping Guide. Yum! This looks absolutely amazing! This almond joy cheesecake must be so delicious! Thanks for sharing the recipe. I’ll be baking this tomorrow for my kids!